Learn how to use be used to and get used to. We use to be used to or to get used to to mean accustomed to or to get accustomed to. Be careful, a common mistake is confusing be used to with used to which is used to describe the simple past. If you need to learn how to use used to to speak about past habits or actions, please read my previous lesson on that subject. Let’s study be used to and get used to! We use BE USED TO when we describe something that seems normal, that we are accustomed to, or that we are familiar with. We can use BE USED TO when speaking about present or past time. Be careful, you cannot use BE USED TO when talking about frequency (usually). (Wh-) + BE + Subject + USED TO + VI + ING ? (Wh-) BE + Subject + USED TO + NOUN (PHRASE) ? Are you used to hot weather? No, I am not used to hot weather. I am used to cooler weather. What time are you used to waking up? I am used to waking up at 8:00. Today I woke up at 6:00. I am not used to waking up so early, so I am very tired now. When I was a child, I was used to waking up at 6:00. 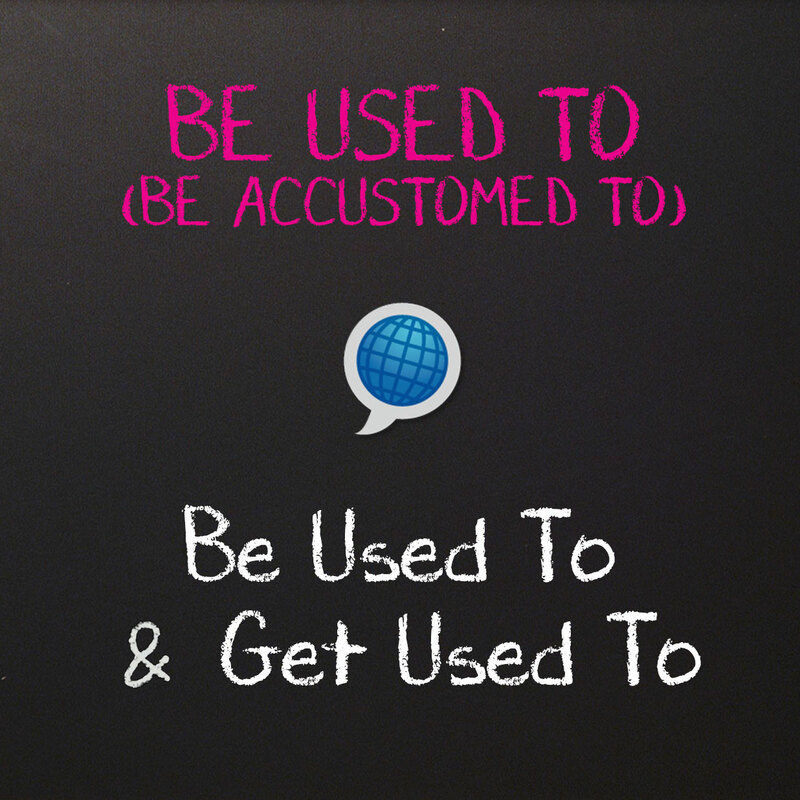 We can also use GET + USED TO to show something that we are, or are not, becoming accustomed to. We can use GET USED TO when speaking about present, past, or future time. It has the same form as ‘BE USED TO’. Are you getting used to eating American food? When I arrived in Miami, I didn’t like American food. However, now I am getting used to it. I might like American food, but I hope I never get used to the huge portions! When I worked in a bank, I wore a tie every day. I never got used to wearing a tie; I hated it! The traffic in Miami is HORRIBLE! Don’t worry, you’ll get used to it sooner or later. Be Used and Get Used To. Download this FREE English lesson with exercises! Alex was late to his first English class on Monday. I don’t think he…. ______________________________________ (be / wake up) early. I love wearing shorts in this hot Miami weather. I … __________________________________(be / wear) a heavy jacket at home in Moscow. When I first moved to England I needed to…______________________________________ (get / drive) on the left. I love this warm sunny weather. I … _______________________________(be / not) it yet, though. I keep forgetting that I don’t need to carry a jacket. B. Your American friend is moving to your city next year. Write them a letter telling them about what they will need to get used to. That’s it for today. Remember, don’t confuse be used to and get used to confused with used to, which is used to speak about past habits or actions. If you have any questions, just ask. You can email me or just comment below. Don’t forget to sign up for our newsletter, or even better yet come visit Language On English Schools in Miami or Miami Beach. Now get out there and use be used to and get used to.